The bowlers were murdered on the placid wicket at Galle as eight batsmen hammered centuries during five days and just 19 wickets fell in the entire match. Sri Lanka declared their first innings at 570 for the loss of four wickets followed by 4-335 in the second. Bangladesh gave a sterling reply in the first innings by amassing their best ever total of 638 in Test cricket and scored 70 runs in the second. 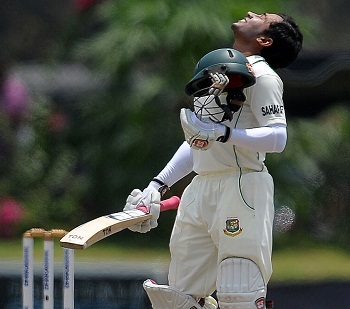 Mushfiqur Rahim, the skipper of Bangladesh, was declared ‘Player of the match’ for his herculean innings of 200 runs. The first Test of the two match series came to an end on Tuesday, March 12, 2013, at Galle International Stadium. The Islanders begun the day at 1-116 scored in 30 overs whereas Tillakaratne Dilshan was unbeaten at 63 and Kumar Sangakkara was at the other end for 49. The latter completed his fifty in the very first over and kept the score board busy with Dilshan who was progressing well at his end. The boundaries started flowing regularly from the willows of the two batsmen after the 39th over as Sangakkara hit 2 consecutive fours in the 47th over. Dilshan thrashed his 16th Test match century on the last ball of the 48th over and the second hundred of the hosts was displayed on screen in the 50th over. Kumar Sangakkara dispatched his successive ton in the match on the first delivery of the 55th over and that was his 32nd hundred in the longer version of the game. He was caught by Jahurul Islam off Mahmudullah in the 61st over after contributing 105 from 172 balls with 10 fours as the score touched 230. Kithuruwan Vithanage joined in next with Dilshan who became the second victim off Mahmudullah for 126 scored on 190 deliveries comprising 9 fours. The captain of Sri Lanka, Angelo Mathews, got in next as Vithanage hit the first six of the innings in the 74th over. The latter added 2 fours in the 77th over and achieved his maiden Test fifty on debut with a four but he was clean bowled by Mahmudullah for 59 off 70 with 1 six and 7 fours. Angelo Mathews reached 38 and declared the second innings at 335 in 83 overs with six wickets in hand. Mahmudullah was the highest wicket taker among eight bowlers with three whereas Shahadat Hossain claimed one. Bangladesh was given a target of 268 runs in the possible 37 overs remaining in the match. The decision proved vital from the Lankan Lions’ point of view since Shaminda Eranga got rid of the opener Anamul Haque for just one run in the second over. The seasoned campaigner, Mohammad Ashraful, got together with Jahurul Islam who got 2 fours in the sixth over off Eranga. The first remained cool at his end and scored just seven runs from the 27 balls he faced. 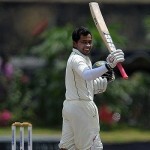 Jahurul Islam kept on cruising with regular boundaries and hit 1 six and 1 four in the 12th over as the score reached 44. The batsmen went back to their shells and added just 13 runs in the following seven overs as Mohammad Ashraful tasted his first four in the 20th over. The match was called off after 22 overs when Bangladesh scored 70 runs whereas Jahurul Islam and Mohammad Ashraful occupied the crease with 41 and 22 runs respectively. The first Test ended in a draw after the batsmen from both sides enjoyed batting at a wicket which was full of runs. The second and final Test of the series will commence from March 16, 2013, at R Premadasa Stadium, Colombo.